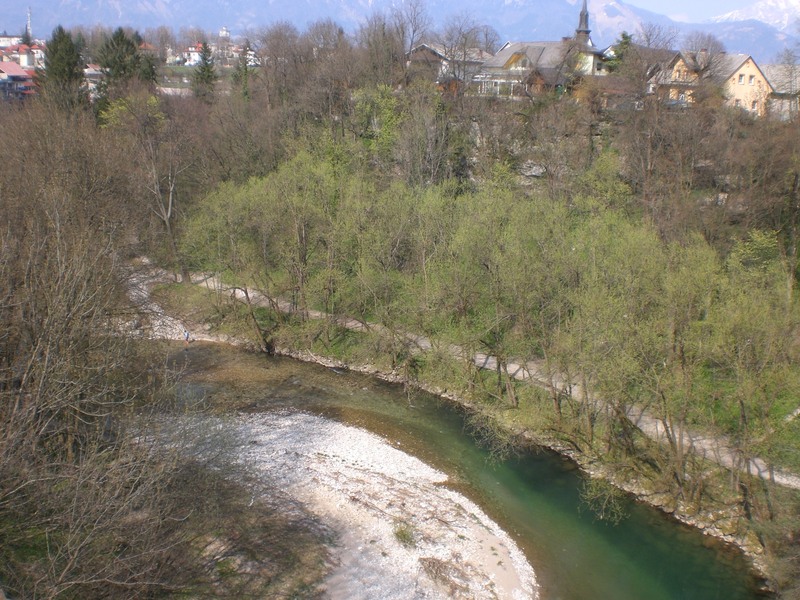 The old town of Kranj, the capital of the Gorenjska region, sits on a terrace above the 30-metre deep Kokra canyon, which was formed by the Kokra river carving its way into the conglomerate terrace dating back to the Ice Age. 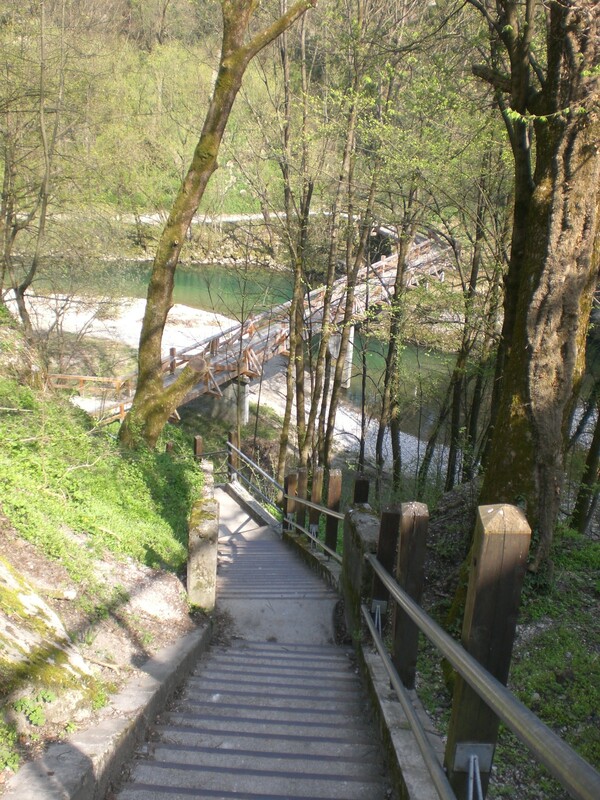 The recently constructed Educational Trail runs for about 2km beside the Kokra river and is best accessed down the long flight of stairs beneath the bridge over the river in the centre of the old town. It makes a great addition to the old town centre which sadly, like so many other town centres these days, is in decline due to the many out-of-town shopping centres that have sprung up here, there and everywhere. The trail means a walk through the old town can now be extended somewhat before returning to enjoy a cuppa and a cake at one of the many cafes which, together with the town’s museums and a meagre sprinkling of shops, are largely all that remain in the old town centre. After descending down to the river you can walk along either bank of the river and make a circular route. However, unfortunately at present its not possible to walk the circular route as some weeks back a lorry travelling over the narrow bridge, unsuitable for lorries, at the far end of the canyon, managed to reduce it to a twisted wreck of metal and concrete. 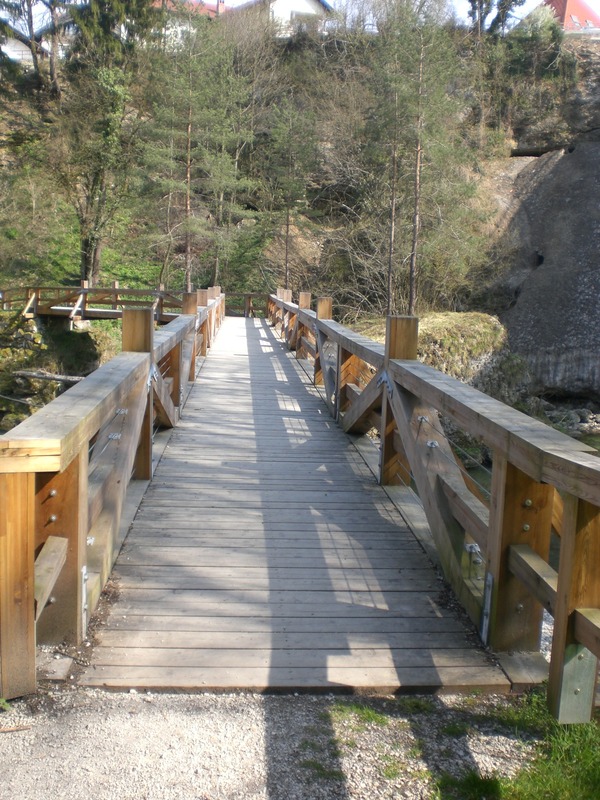 It is hoped they will repair the bridge as soon as possible but nevertheless its still a nice enough place for a short stroll whilst visiting Kranj. Its still possible to make an almost, albeit very short, circular route by descending the stairs and staying on the same side of the river i.e. don’t cross the bridge, and continue until just short of the mangled bridge, then take the road uphill which leads back to the old town centre. 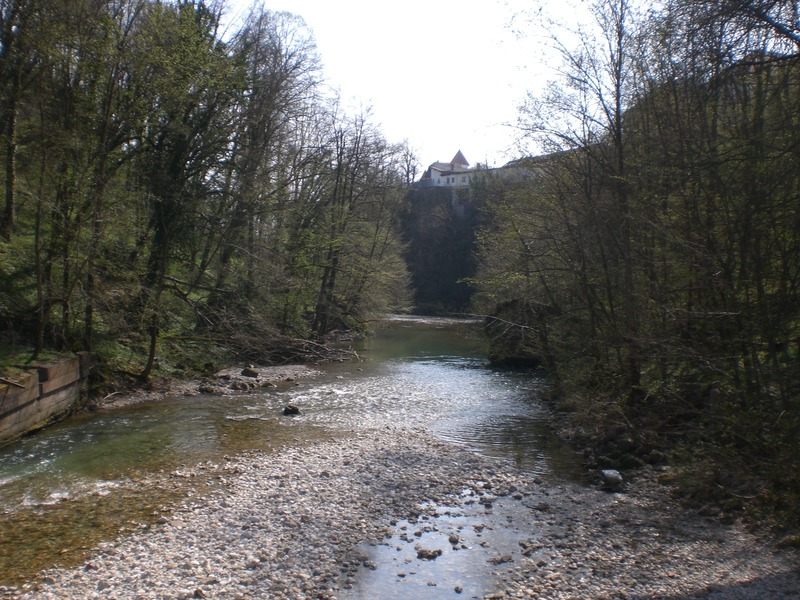 Its interesting to note that in Dol, on the right bank of the river, there was once a public bathing resort. The resort, which opened in 1900, was open from June to September and was divided into sections for men and women. It was in use until 1916 and then again for the short time after the First World War. Today, just the remains of the foundations of the changing rooms, and the stairs on the riverbank serve as reminders. Kranj is well served by public transport, so reaching the town from Radovljica, which also has excellent transport links, is easy. Regular buses and (slightly less regular) trains run from Ljubljana – Jesenice, stopping at, amongst others, Kranj, Radovljica, and Lesce-Bled stations.